Holding onto a job right now is tough enough. Mix in a backstabbing co-worker, and it could get even tougher. So, how can you pick out the office snake - the one seeking to undermine and sabotage you, your reputation and your career at every turn - the one spreading rumors about you - the one putting you down to your boss behind your back - the one stealing credit for your ideas - and how can you deal with the situation before it gets out of control? On The Early Show Saturday Edition, career coach Sue Morem, author of "How to Get a Job and Keep It," offered words to the wise. How big a problem is office backstabbing, and how does it affect people at work? It's a big problem: People problems are at the core of almost all workplace complaints. When we feel alienated or betrayed, we are more anxious, fearful and stressed. Our focus shifts to finding the source of the problem or figuring out how to deal with the person we think is sabotaging us and as a result, we are less productive. Is the problem worse now because of the bad ecomony? Yes, much worse, because everyone is worried about losing his or her job. There is also less of a support system (workplaces are more lean), and there's just an overall feeling of stress. What are some of the complaints you hear most about people in the office? 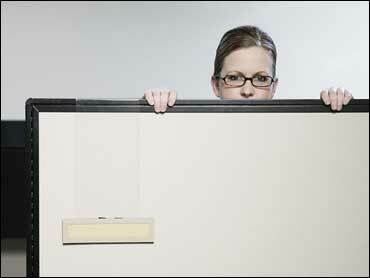 It's always about someone else: the annoying coworker, the difficult boss, the mean-spirited or competitive colleague. It's people who push our buttons and make our lives miserable. What signs should we look for to help us identify a potential problem? It can be difficult - it's not always specific. Sometimes it's a "gut feeling." You might hear rumors being spread about you, you might feel tension with others, or it could be as blatant as someone purposely withholding information, ignoring you, belittling you, or blaming you for something you didn't do. a) The backstabber: Watch out for this one - he might appear to be on your side, but behind your back he will bad mouth you, lie about you and may be out to destroy you. The backstabber tries to make himself look good at your expense - by making you look bad. Pay attention to how you feel around this person and what you hear; seek clarification if you're getting mixed signals. b) The gossiper: Keep in mind that those who gossip to you will gossip about you. It doesn't hurt to listen to what you hear - just don't participate in the conversation. Often, the industry grapevine is true, but the gossiper tends to exaggerate, so beware. Some people feel they'll make themselves look better by spreading information, especially about someone else. The good news is that most people catch on to this tactic, but not always before damage is done. c) The credit-robber: There are people who take credit for other people's ideas in order to shine the light on themselves, no matter whom they steal from to do it. The credit-robber usually steals the spotlight when you least suspect it, and in front of others. Being caught off-guard makes it difficult to know how to respond and, by the time you catch your breath, you've lost your moment. d) The unsupportive supervisor (who has it in for you): This is a tough one: When you don't have your supervisor on your side, you're on your own. Many supervisors feel threatened by their staff; some thrive on the power they feel from making others feel small. You must be very careful when the problem is your supervisor - as with any negative scenario, you need to take a step back to evaluate the situation and do everything you can to protect yourself. What are some overall tips for dealing with these toxic co-workers? 1. Take Ownership: We're often quick to point fingers, but sometimes the problem is within; look to yourself first and ask, "How might I be contributing to this?" 2. Confront the source: It doesn't do any good to talk to everyone about a problem you have with someone else. Approach the person you are troubled by, but don't be accusatory. Speak in terms of "I," rather than pointing fingers. Seek clarification; ask questions rather than making accusations. Avoid putting the other person on the defensive. 3. Document the information: When you are having ongoing problems with someone, it's important to document what's taking place. Keep a journal/notes of conversations and keep copies of e-mails, voice mails, or any other communication should you need to prove your case in the future. 4. Choose your battles wisely: Some things aren't worth challenging. Save your battles for the important issues - those that affect your reputation, and your livelihood. 5. Finally, know when to walk away: When you've tried everything, but the problem persists, sometimes the best thing to do is to walk away. If you dread going to work, you resent your boss and the company you're working for, and you aren't performing to your capacity, you're probably better off leaving, and trusting that you learned from this and will find a better situation in the future. There are a lot of problem people out there, but there are also many great people and companies to work for - you just have to be willing to look for them.